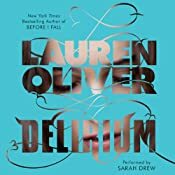 Lauren Oliver's Delerium tells of a future where love is treated as disease that has to be eliminated. It is Amor Deleria Nervosa, and at the age of 18 young people have a brain operation to stop them from ever falling in love. Once Lena has had her "cure," she will be paired with a young man in marriage. She has only a few months to go before she turns 18, and she is nervous about her evaluation before her cure. Much hangs on it, because her examiners will decide on her future, based on how she does. She has special reason to be nervous because of her mother, who committed suicide after 3 attempts at a cure, none of which worked. Her father died young too, so now Lena lives with her aunt and other family members. She is very bright and passionate, but she is short and ordinary-looking, and compared to her best friend Hannah, she feels unexceptional. Lena is shy, but Hannah is outspoken and critical. But it is Lena who starts to question everything she has been taught about life and society. They are told that in the old days, when there was love, chaos ruled, and divorce was rampant. Now divorce is very rare and society is far more stable. But it is a society without love or passion. It is also rigidly controlled: there is a large electrified fence around their city, Portlane, Maine, and there are just rumors about the groups of "invalids" who live outside. The plot is standard fare for stories of young love in repressive regimes. Lena meets Alex, a young man who has apparently been cured, yet who seems to know more than he should, and who displays an unusual interest in her. There are adventures and narrow escapes; there are secrets unhidden, and there is beautiful and desperate love. The most interesting and original part of the novel is its central idea -- a society that makes love an illness. One might question whether it is plausible this could ever happen, but that is basically irrelevant: we rarely worry whether the futures portrayed in 1984, Blade Runner, or The Matrix are in fact likely to happen. The question is more whether the book is able to paint a convincing picture of how people would react when living in such a society, and whether the book is able to use the dystopian idea to make a strong point. In Oliver's extraordinary first novel, Before I Fall, her teenage lead character was trapped in a Groundhog Day recurrence of tragedy, and she had to work out how to bring the repetition to an end. Delerium is a little less distinctive, and the characters are not quite as strong. Lena's relationship with Alex does not quite have the spark necessary to make it a great romance. Her relationship with her best friend Hannah is more sharply drawn, with less cliché. While Alex has a mysterious past and indeed a mysterious present, Lena knows all about Hannah and they have a long history together. They go running together, and it is on those runs where they talk with each other that Oliver's writing really shines. Lena does not really need to fall in love with Alex to know the loss that the "cure" will cause, because the intensity of her feelings for Hannah is strong enough to show her the power of love and to make her question everything she has been taught about love as a disease. One quibble with the book is that there are some gaping holes in the plot. For an authoritarian regime, it is remarkably inefficient and lax in its security. As author, Oliver faced a dilemma whether to go into lots of detail about how Alex and Lena could manage to get past the security in some crucial plot moments, and she was right not to focus too much on that aspect, because it would be distracting. Nevertheless, too often one gets the sense that she is relying on the "with one bound, he was free" solution to problems she has created for her characters. As a philosopher, I would have liked more focus on why it makes a good deal of sense to question our ideas of love and to deconstruct our ideology of romance. Her portrayal of romance makes it a universal good of human experience, always potentially available and only eliminated through the abuse of medicine. But we know perfectly well that very often love does make us stupid and blinds us from an objective assessment of other people. The reason that the idea behind Delerium is so rich is precisely that love is a kind of madness, bringing pain and risky behavior. The greatest dystopian stories are those where a strong case can be made for repressive treatment to avoid human folly, and Oliver doesn't give that case much weight. I'd have been even more thrilled if Oliver had included more about how the ideology of love is far from a human universal, but is mostly a Western idea of the last few hundred years, and is not easily translated to other cultures or ancient times. Unfortunately she didn't include those ideas in this book, but since it is projected as the first in a trilogy, there is still hope. Oliver was a literature and philosophy major, and her ability to highlight philosophical ideas makes her novels stand out from the crowded field of YA literature. This was an enjoyable audiobook, performed by Sarah Drew, who also did Oliver's first audiobook. Drew is convincing as a teenage girl narrating her journey of discovery, and she has a good ability to distinguish the different characters.